Over the course of a 50-year career, James T. McLaughlin has sought to open the playing field of psychoanalytic exploration by treating unconscious processes as the very material from which we fashion meaningful lives. His unique, iconoclastic perspective, which challenged the conventions of his time and professional milieu, not only engages the creative tension between the stance of the analyst and the stance of the healer, but also contains striking intimations of contemporary relational and interpersonal models of psychoanalytic treatment. The Healer's Bent, which thematically integrates published and unpublished papers and contains three chapters of heretofore unpublished autobiographical reflection, bridges analytic practice and other psychotherapeutic modalities. It will make McLaughlin's distinct approach to clinical theory and practice widely available to a broad and receptive readership. "James McLaughlin has the rare gift of being able to write with unusual grace and unaffected vulnerability about the truly human elements in the therapeutic encounter. This brilliant compilation of rich, penetrating, and highly personal papers welcomes fellow travelers into the heart and mind of a profoundly humane psychoanalyst and leaves them feeling less alone in their own elusive pursuits. The Healer's Bent is a powerfully illuminating and deeply touching chef-d'oeuvre that will surely become a classic in the field." "For thirty years James McLaughlin has been writing a series of thought-provoking, often challenging papers that, in addition to being highly stimulating, are works of prose poetry; papers that, written in Jim's distinctive, Irish-tinged voice and peppered with flights of imaginative imagery, mark him as the most original, free-spirited, and leprechaunish of our authors. In his detailed descriptions of analytic hours, Jim brings to life, as few can, the essence of the analytic situation." "[Mclaughlin's] journey and evolving point of view are etched clearly on the pages. The reader has the sense of being in the presence of a very thoughtful, sincere person who has earnestly tried to do his very best. Although I myself did not know him personally, I feel confident that he would strike anyone who met him as a genuinely fine person." 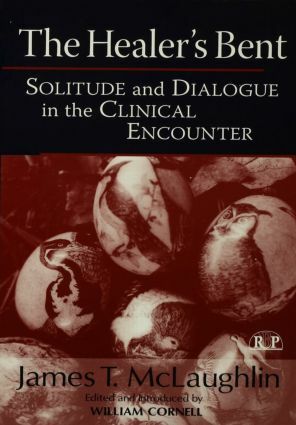 "Throughout his writings, one has a sense of the deeply personal involvement he has with his patients and the focus of his clinical concern on the relationship and interaction evolving between analyst and patient as the analytic process works itself out. the present volume makes these connections much more apparent and explicit, so that readers will have a unique opportunity to study how these processes came to intersect in the development and clinical thinking of at least one gifted and thoughtful analytic clinician." 11. Dumb, Blind, and Hard: Can an Analyst Change His Spots? The Relational Perspectives Book Series (RPBS) publishes books that grow out of or contribute to the relational tradition in contemporary psychoanalysis. The term relational psychoanalysis was first used by Greenberg and Mitchell (1983) to bridge the traditions of interpersonal relations, as developed within interpersonal psychoanalysis and object relations, as developed within contemporary British theory. But, under the seminal work of the late Stephen Mitchell, the term relational psychoanalysis grew and began to accrue to itself many other influences and developments. Various tributaries—interpersonal psychoanalysis, object relations theory, self psychology, empirical infancy research, and elements of contemporary Freudian and Kleinian thought—flow into this tradition, which understands relational configurations between self and others, both real and fantasied, as the primary subject of psychoanalytic investigation. We refer to the relational tradition, rather than to a relational school, to highlight that we are identifying a trend, a tendency within contemporary psychoanalysis, not a more formally organized or coherent school or system of beliefs. Our use of the term relational signifies a dimension of theory and practice that has become salient across the wide spectrum of contemporary psychoanalysis. Now under the editorial supervision of Lewis Aron and Adrienne Harris with the assistance of Associate Editors Steven Kuchuck and Eyal Rozmarin, the Relational Perspectives Book Series originated in 1990 under the editorial eye of the late Stephen A. Mitchell. Mitchell was the most prolific and influential of the originators of the relational tradition. He was committed to dialogue among psychoanalysts and he abhorred the authoritarianism that dictated adherence to a rigid set of beliefs or technical restrictions. He championed open discussion, comparative and integrative approaches, and he promoted new voices across the generations. Included in the Relational Perspectives Book Series are authors and works that come from within the relational tradition, extend and develop the tradition, as well as works that critique relational approaches or compare and contrast it with alternative points of view. The series includes our most distinguished senior psychoanalysts along with younger contributors who bring fresh vision.